Several factors determine the kind of nickname you call a guy. For example, what is your relationship with this guy? What type of nickname do you want to give this guy? What is the purpose of this nickname; is it a term of endearment or you just want to mock this guy? These factors will determine what nickname you should give this guy. 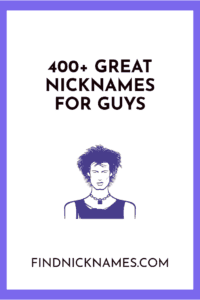 In this article, you will learn how to come up with nicknames for guys. Additionally, this article contains a huge list of nicknames for boys to help you get the creative juice flowing. Let’s start with how to come up with nicknames for boys. There are many ways to come with nicknames and as such, finding a nickname for a guy should not be in any way difficult. A boy’s physical attributes is a great source of good nicknames. Physical features such as height, body frame, hair color, and other physical attributes that stand out are all great sources of fun nicknames for boys. A short guy can be called Shots because glasses used for shots are often small. A fat guy can be called Beefy because of his meaty frame. A man with one eye could be called Half-Time or Pirate because he can only see through an eye. A boy with blonde hair can be called Goldilocks because of the color of his hair. A guy with a long neck can be called a Giraffe. Also, these sort of nicknames can be ironic. For example, a bald man can be dubbed Afro, which is ironic since he can’t grow an Afro. Also, a nickname can describe a guy’s personality. There are several fun pet names for shy guys, funny guys, outgoing guys, and every other personality type. A guy can be dubbed Vegas because of his love for nightlife. A guy can be called Frozen because of his calm demeanor. A guy can be nicknamed Gandhi because of his thoughtfulness. A guy can be called firecracker because of his hot temper. These types of pet names can equally be ironic. For example, Quiet Tom could easily be a motormouth. Also, you can use a boy’s nickname to find him great pet names. You could shorten, modify or combine both methods to give him a great nickname. Robert becomes Rob, Robbie, Bob, or Bobby. Slim Jim because of Jim’s slender frame. Dave the Rave because of Dave’s love for parties. Sarcastic Joe because of Joe’s love for sarcasm. Besides, you can add cute words to his name. For example, Joe Muffin, Robert’s Honey, etc. Also, a guy’s hometown, country or the continent he comes from, could be a good source of nicknames for him. Kentucky Fried: A fun nickname for someone from Kentucky, USA. Kiwi: A commonly used nickname for people from New Zealand. Banana Bender: Slightly derogatory nickname for people from Queensland, Australia. Arky: A person from Arkansas, USA. Scouse: A person from Liverpool, UK. Punjab: A stereotypical name for an Indian guy. Be careful not to come across as racist when you give a guy a nickname based on his nationality. Like Lewis Carroll’s character ‘Humpty-Dumpty,’ some nicknames can be based on rhymes and connotations. Jake the Snake: A good name for a shifty guy. Jim The Jester: A good nickname for an expert in making fun of people. Tim Tricky: A good pet name for a trickish guy. Silly Billy: A popular nickname for a guy who is a bit silly. Slim Jim: A cool nickname for a thin guy – or a bit of a sausage! Luke the Fluke: an ideal nickname for someone who gets lucky a lot. You can come up with several fun rhymes to make a cute pet name for a boy. Furthermore, nicknames for guys can be derived from his occupation or even his college major. Prof: an ideal nickname for a professor or academic. Sparky: a good nickname for an electrician. Chef: a good name for chefs or cooks. Lifesaver: a good name for a doctor. Sergeant: a good nickname for an officer. If you’re trying to come up with a nickname for a little kid, you can ask him what he would like to be when he becomes a grown up; then you can call him a pet name based on his answer. Every guy has unique quirks or mannerisms. Mostly, these mannerisms are annoying, but they can be cute as well. Radio: a great nickname for someone who someone who snores. Blinky: a perfect pet name for a person who blinks a lot. Twitchy: ideal for a guy who twitches or moves around a lot. Spangles: an awesome nickname for your high-energy and flamboyant friend. Conductor: a good pet name for a boy that uses hand gestures a tad too much. Mannerisms could also be a word he uses all the time. For example, Bro is a great nickname for a guy who says “Bro” a bit too often. Also, nicknames can be based on a guy’s initials. This type of nicknames is popular among athletes and famous personalities, but it works for any guy as well. JJ: a common nickname for a person with two ‘J’s in their initials. KC: a conventional initialization of Kingsley. CR7: Cristiano Ronaldo’s initials and jersey number. Also, you can use a boy’s hobbies, his likes and his dislikes, to find him a nickname. Wisecrack: For a funny person. DaVinci: For a great artist. Caffeine: For a guy who can’t do without his morning coffee. Numbers: For a guy that is good with numbers. MJ: For an excellent dancer. Also, you can give a nickname based on something he dislikes. For example, calling a vegetarian a — Meat lover. Additionally, nicknames can be gotten from popular cultural references such as TV, Video Games, and Books. Heisenberg: From Breaking Bad, for a guy who looks like he has a meth lab. Hobbit: From Lord of the rings, good name for a guy who has a big foot. Romeo: For a lover boy. Homer Simpson: For a playful guy. Nicknames based on inside jokes are often the best types of nicknames because the person might never know the true meaning of his nickname. Antenna: for a guy who always figures when there’s food around. Potholes: for a guy, everyone loves to avoid. Cuffs: A guy who traps you with uninteresting conversation. Wet Paint: For a boring guy. Dragon: For a guy with killer breath. Gandhi: A knowledgeable and calm dude. Andre the Giant: For a huge guy. Bill Gates: For a rich guy. CIA: For a secretive and mysterious person. Ronaldinho: For a great soccer dribbler. Now that you’ve read through the ways to come up with a nickname, it is time to learn the type of nicknames you should avoid calling a guy. Aside from awesome nicknames, there are some nicknames you should avoid using for any guy: Recycled nicknames, overly mushy nicknames, pet names that are difficult to pronounce and racist nicknames. First on the list is recycled nicknames. Recycling might be good for the earth but when it comes to pet names for loved ones, avoid recycling nicknames. Especially the pet names you used for past lovers, don’t ever use them for another boyfriend. It will get him angry, and it will make him hate the nickname. Secondly, you have to avoid girly nicknames for guys. Some pet names are awesome and adorable but a guy wouldn’t like these nicknames because they are too feminine. Guys prefer pet names that make them feel badass, not overly sweet nicknames that will make their friends laugh at them. Thirdly, you should run from pet names that are hard to pronounce. Choosing a nickname that is too difficult to pronounce or too complicated doesn’t do you any favors. Stick to simple pet names that are simple to pronounce and have simple meanings. Lastly, don’t use racist nicknames. Racial abuse is bad, and as a result, you should avoid any nickname that comes across as racist. Calling an Arab guy a terrorist is racist, and you avoid such nicknames.